Vulcano is a volcanic island off the coast of Sicily. It is one of the Aeolian islands that also include Stromboli, Lipari and Panarea. It lies in the Tyrrhenian Sea. Vulcano is one of the Aeolian Islands and is the closest island to Milazzo on the Sicilian mainland and can easily be reached by ferry. Each of the Aeolian islands has something different to offer. Lipari is the largest and liveliest, Panarea the most chic and Stromboli has a live and active volcano. Vulcano offers a real volcano experienc but is not for the faint hearted! Vulcano is a dormant volcano but it is not extinct and the various craters and the many fumerolles belch out sulphur smelling gases which are difficult to stomach especially if you wish to get up close to the crater. For those whose noses can take it Vulcano is a great place for a treck to a smouldering crater. The lunar landscape is quite eerie and the number of smoking fumaroles mean you need to stick to the paths at all times, and preferably go with a guide. The main craters to hike to are Vulcanello, the most recent volcano on Vulcano, and the 'Grand Cratere'. Vulcanello used to be a seperate island but a series of eruptions led to it joining Vulcano. The trail to Vulcanella is reasonably easy and leads to a large caldera (a depression left when the cone collapsed). Nearby is 'Monster Valley' where erosion has created 'monster' shapes in the larva rock. Sadly many of these have been pinched to decorate gardens of local villas! The Gran Cratere is a hike of around an hour and at the top you have magnificent views of all of the Aeolian Islands and also in excellent conditions views of Sicily and Italy too. 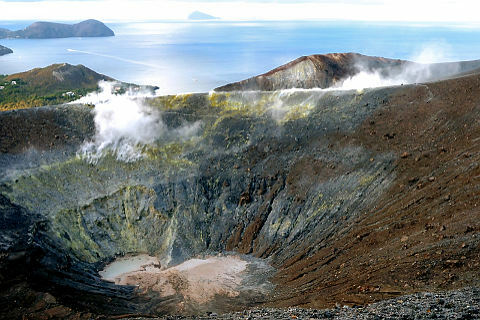 The main crater is the Caldera de la Fossa and it has a diameter of 500 meters. Fumaroles in the crater are permanently releasing steam reminding you that this volcano is not extinct! The last eruption was in 1890. The accumulation of gases in the crater means that it is not possible to enter the crater. The trails to the craters start at Porto di Levante where the ferries arrive and can all be done on foot from there. As well as the walks to the craters many visitors come for the mud baths. Next to the beach at Porto di Levante is the famous mud pool the 'Terme di Vulcano' where you can bathe in hot sulphur-smelling mud. Not for everyone but it is reputed to be good for the skin. Bring an old swim suit that you can throw out as apparently the sulphur smell will not come out of the fabric and will even stay on your skin to some extent for a couple of days. It is possible to take the ferry from Vulcano to any of the other Aeolian Islands. Lipari and Panarea are the most popular as well as hiking trips to the crater of Stromboli or night time boat trips around the island to admire the fiery display. Hugely popular not only for their great beaches and water sports but also the possibility of visiting active volcanoes. Lipari is the liveliest of the Aeolian islands and has an attractive harbour and town and great beaches. Popular for its beaches and scenery Panarea is the second smallest Aeolian island. Milazzo has great beaches as well as a walled town on top of a hill, a medieval town and a newer town. Plenty to do and see!